Dashboard views are essentially saved filters that allow you to easily customize the list of tickets on your dashboard. 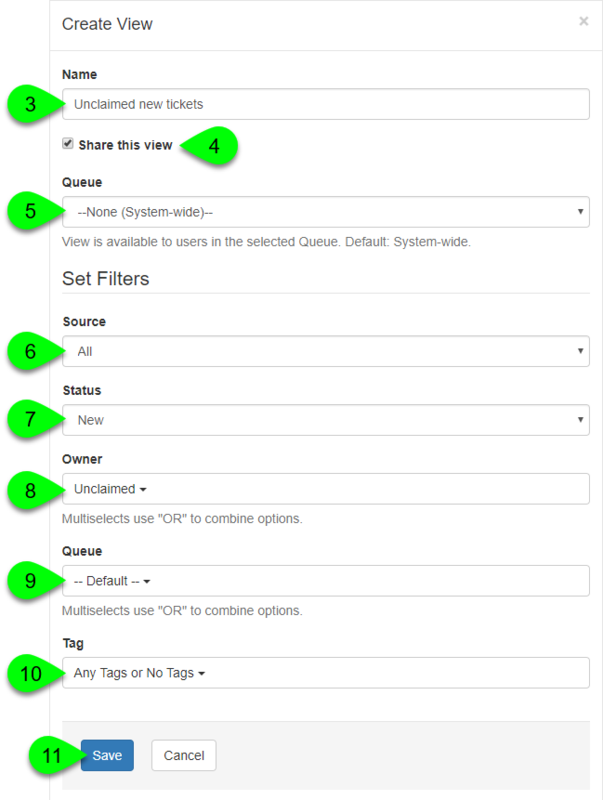 If you find yourself applying the same filters over and over again while viewing the dashboard, then using a custom view can save you tons of time. Any user can create a custom dashboard view; however, only admins can share custom views with other users. Go to Admin > Views. Click on the Create a View button. In the Create View window, give your custom view a name. This is what will display when selecting your view on the dashboard, so you'll want to keep this concise. If you're an admin, select the Share this view checkbox if you'd like to share this view with other users. If the Share this view checkbox has been selected, select the queue you'd like to share this with (or select "None (System-wide)" if you want to share it with all users). To view tickets in a specific status, select which status to view. Pro tip: to view all new, open, and pending tickets, choose "Not Closed". To view tickets owned by specific users, select which owners to view. For example, to view only your own tickets, select your name from the Owner dropdown. To view tickets in specific queues, select which queues to view. Leave this at "Default" to view tickets from all of the queues you have access to. To view tickets assigned specific tags, select which tags to view. When you select multiple tags, "AND" logic will be applied. For example, if you select "Tag A" and "Tag B", this view will only display tickets that have both "Tag A" and "Tag B" assigned to them. You can toggle between all of your custom views while viewing tickets the Dashboard. The Manage Views page will list all of the views you have created. To edit a view, click on the Edit View () icon in the Action column. To delete a view, click on the Delete View () icon in the Action column. If this is a shared view, it will be removed from all users.